War orphan and post-war delinquent, Akiyuki Nosaka (born in 1930) won the Naoki literary prize in 1967 for a pair of autobiographical novellas, Hotaru no Haka and Hijiki America, which have unfortunately not been translated into English to my knowledge. He is known in the West as the author of The Pornographers, his first novel (originally published in 1963, and published in Michael Gallagher’s English translation in 1968), adapted in 1966 by Shohei Imamura into a confronting “adult” movie. 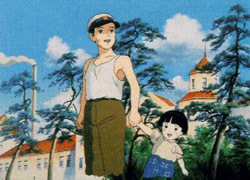 It is hard to see any connection between Takahata’s heart-rending, tender adaptation of Hotaru no Haka and Imamura’s black “introduction to anthropology”. Imamura’s live action portrayal of obsession, lechery and perverse sexuality in the life of the pornographer is decidedly unsuitable for children and disturbing even for adults; its ugly world is rendered in harsh B&W cinematography. Tombstone for Fireflies is not only animated and suitable for family viewing; it is exquisitely beautiful with its painterly washes of colour and moments of pure lyricism. However, though Takahata has softened Nosaka’s expiatory memoir, dark undercurrents remain. Patrick de Vos has noted two obsessive themes in the work of Nosaka: a morbid eroticism that is fundamentally incestuous; and grimacing death, over whose mask hovers the shadow of a gentle nostalgia. Takahata renders the relationship between older brother and baby sister loving and tender, and colours it strongly with retrospective pathos; only in one scene (in the cave shelter at night, when both are sleeping fitfully) does he hint at incestuous or pederastic desire. But the film is littered with corpses- victims of bombing and starvation at the end of the War. With his novella, Nosaka sought to exorcise his personal sense of guilt at having alone survived the disasters of the war. Takahata seems to share Nosaka’s desire to arouse the memory of history, and takes pains to remind his smug and prosperous compatriots (before the bubble burst) of a repressed history of national and personal shame; to re-enact or, more precisely, animate the death, destruction and suffering which were the fruits of national imperialism and militarism. He shows people behaving selfishly and callously in these devastating conditions; relatives, farmers, even doctors are found wanting in humanity. But he also shows devotion and love (albeit carefully inscribed in a retrospective narrative that smacks of special pleading or wishful thinking) between brother and sister; and he shows them having fun, playing games and exercising their imagination in life-enhancing ways. The ephemeral fireflies, which fascinate the children and accompany them everywhere, become a potent and lyrical symbol of the fragility, brevity and beauty of life. This is a most unusual anime film. Far from the world of high-tech sci-fi horror-and-heroism, far too from the fantasies for children, with their crusading heroes and heroines who metamorphose into supermen and superwomen to vanquish evil. Even the delightful ecological parables of Takahata’s partner, Hayao Miyazaki, seem cute and childish in comparison. The only other anime that I have seen which bears some resemblance to it is Jinroh (screened at last year’s Melbourne International Film Festival). It similarly addresses modern socio-political history – opening with documentary newsreel footage and inscribing its fictional narrative within a history of the repression of the left in post-war Japan – and similarly ends tragically rather than triumphantly. But it has a lighter touch, a gentler tone. Jinroh is pervaded by a heavy brooding melancholy. Tombstone for Fireflies does not wallow in mourning, or pile up the horrors; it is a work full of sorrow and pity leavened by lyricism. It opens with the corpse of the narrator, lying beside other corpses, discovered by a railway cleaner; it shows numerous other deaths from bombing raids and starvation; and culminates in the protracted decline and death of a child. But the piles of ashes are transmuted into showers of fireflies. This is not a case of Christian redemption, whereby the spirit or soul of the departed transcends death in some form of life everlasting. Rather, in the tradition of Buddhist philosophy and art, it reminds us with exquisite poignancy that, while all living things are finite and ephemeral, the cycle of life, suffering and death is endless. An English translation of Nosaka Akiyuki’s short story upon which this anime is based was published in the Japan Quarterly, Volume 25, No. 4, 1978. Patrick de Vos, “Nosaka Akiyuki”, in Cinema et literature au Japon, a publication of the Centre Georges Pompidou, 1986, p. 90. Roger Ebert, “Grave of the Fireflies”, Chicago Sun Times, March 19th 2000.